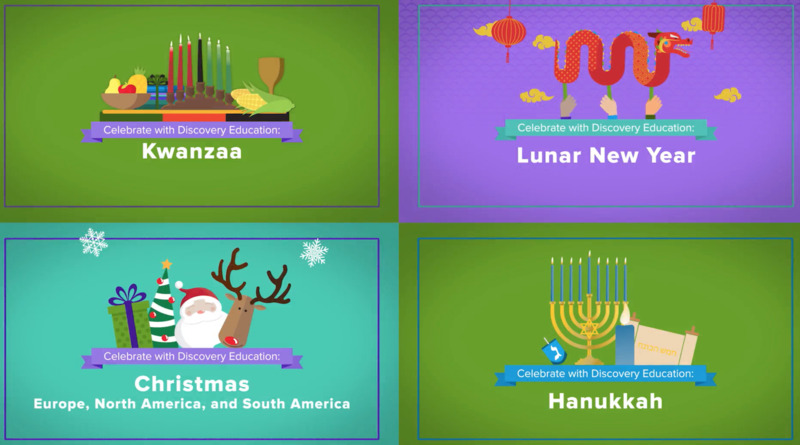 Winter is a time of holidays and Discovery Education is celebrating by hosting a virtual viewing party so students can enjoy learning about various traditions of the season. Join us for this unusual holiday party that brings teachers and students together for a fun-filled exploration that spreads both joy and understanding. A virtual viewing party is a shared viewing experience of a special Discovery Education video. The Holidays Around the World virtual viewing party features the video Celebrate with DE: Holidays around the World. The video reviews the history and traditions of four well-known holidays. Thousands of classrooms will simultaneously access this video and share their thoughts and reflections about holiday celebrations. If this is your first virtual viewing party read our FAQs for additional information. The content and activities are suitable for all grades but we always recommend a preview to determine whether the content suits your needs.